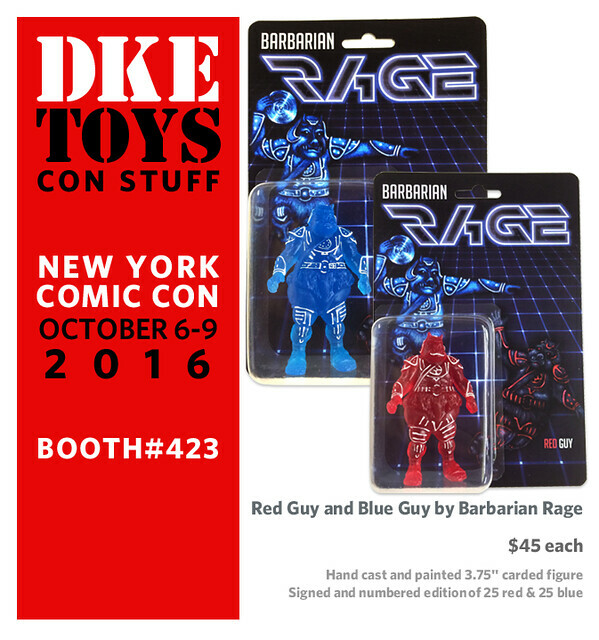 NYCC runs October 6-9 and DKE Toys will be in Booth #423 with a slew of Con Stuff! We will be sending out announcements in batches again as we did for SDCC. This is #2 of most likely only 2 batches. Please feel free to post individually or all at once. 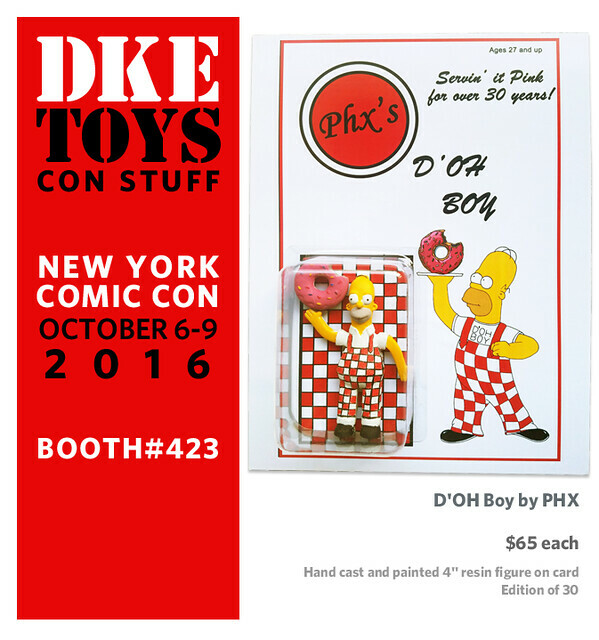 DKE Toys does about 4 conventions a year in which artists from all over the world create limited artist edition figures. Each piece is generally made out of hand poured resin and many are hand painted on custom printed (and sometimes hand drawn) card backs. Sometimes as many as 20 different artists participate in a given show. 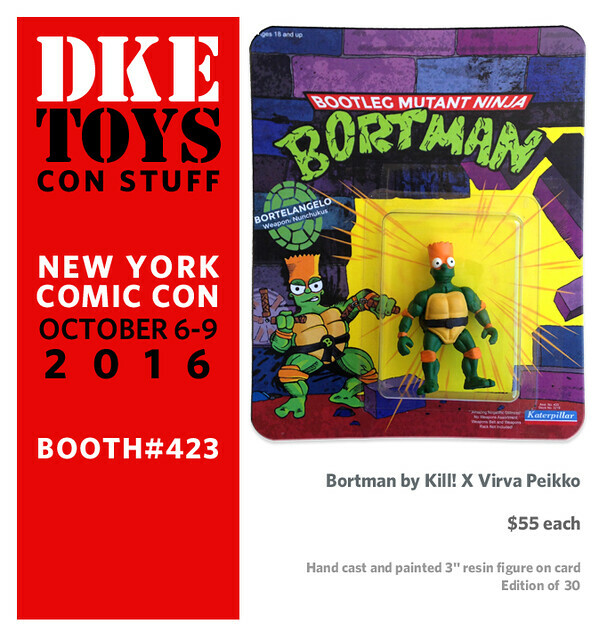 Many have commented that the DKE booth at these various shows look like a small art exhibition. While these figures are generally referred to as “bootlegs” they are far from pirated versions of mass marketed toys. Each of these artists use transformative properties in their work to communicate ideas that are often political, parody, or commentary about the pop culture world we live in. Also please do not be confused by the word “toy”. These are works of art!!! Do not give to a child to play with. They will break, get ruined, and hurt your children physically and emotionally. 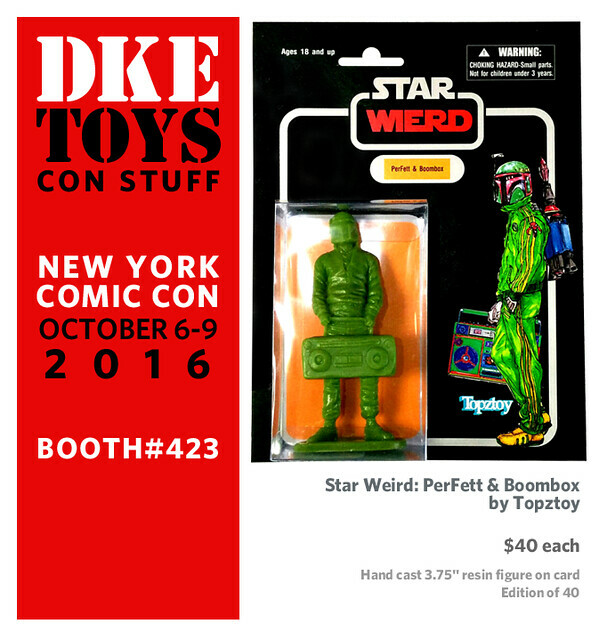 DKE also acquires other limited edition figures from artists that are not exclusives so please stop by to see any unannounced specials. We are always adding images to our Flickr, including unannounced Con Stuff! Follow @sarahjomarks on Instagram for all the DKE stuff you’ve been missing. We saw a one off figure set on Instagram earlier this year. We called Scott to please make an edition for us. He said no way. We begged. Promises were made… Here they are! Hand cast and painted 3.75″ carded figures. Each color a signed and numbered edition of 25. Card back was based on Scott’s original velvet painting. Only $45 each. Never again he said. Scott Cherry is an 8th level Barbarian with a +5 Vorpal Sword and an intelligence score of 2. He makes a Comic Strip out of his original toy line called “Barbarian Rage”. In a follow up to the SDCC sold out edition Boba Classette, Topztoy is back with an equally “weird” figure, PerFett. Each $40 piece is hand cast 3.75″ resin figure on card and an edition of 40. The blister packaging allows for the figure to be removed and replaced with ease for extra “play” value. PHX (pronounced F-I-X) is the brainchild of art duo Kayden Phoenix and Charlie Phoenix. This deviant, gritty, mashup, bootleg toy machine is grounded in Los Angeles and heavily influenced by the entertainment industry. PHX takes a sideways look at pop culture and smashes 2 worlds together, making it art. Come get your PHX! After seeing this piece at Designer Con last year we knew we needed an edition for an upcoming show. 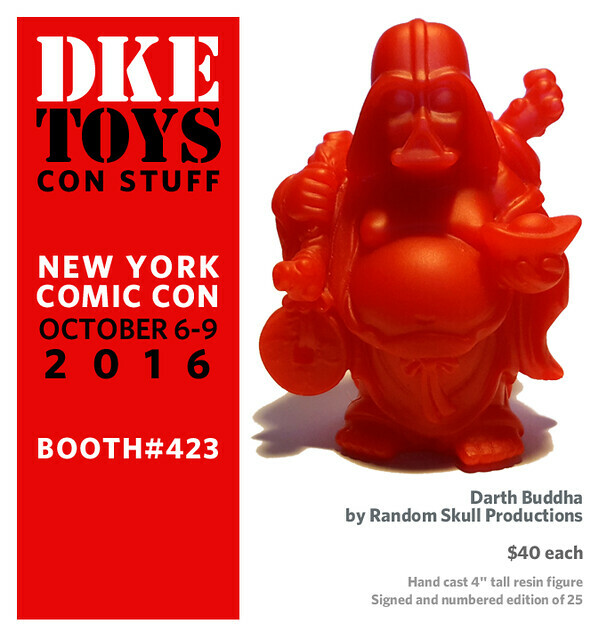 We asked and we received the Darth Buddha Sith Red edition. This deity of the dark side stands just over 4 inches tall and has been hand cast in a limited red colorway. Each figure is signed and numbered and comes bagged with a matching signed and numbered card. $40 each and only 25 made!!! Alex Hallman was born and raised in Pottstown, PA, a small city right outside of Philadelphia. He started Random Skull Productions in the summer of 2013 with two original sculpts one of which was Darth Buddha. With the help of Instagram and a few friends his resin casting and custom toy career took off. Some of his other releases include Sid the Slug and Casey the Coffin. It’s amazing that no one came out with this figure sooner. Back in 1977 Topps Trading cards actually released a trading card with this golden phallus to unsuspecting children. How it got there is a source of some speculation. Prank on the set or irate employee no one quite knows or at least no one is fessing up to it. Now in all its glory you can have your own hand cast and painted 2″ resin figure on card. Only 30 made. $55 each. The Katerpillar is the collaborative works of artists KiLL! & Virva Peikko. Before joining forces in 2012, KiLL! was making resin, plush, and vinyl figures while Peikko was doing sculpture, fiberglass, drawing, painting, etc…. . With their powers combined they produce life-size fiberglass sculptures, comics, trading cards, concert posters, resin figures, and much much more. Both KiLL! & Peikko have had works published in print and have exhibited in solo and group art exhibits all over the world. When not making art they battle hoards of feral cats…. and their dark thoughts. What do you get when our favorite bad kid gets mashed up with an animal from the sewers? Yup, Bortman. 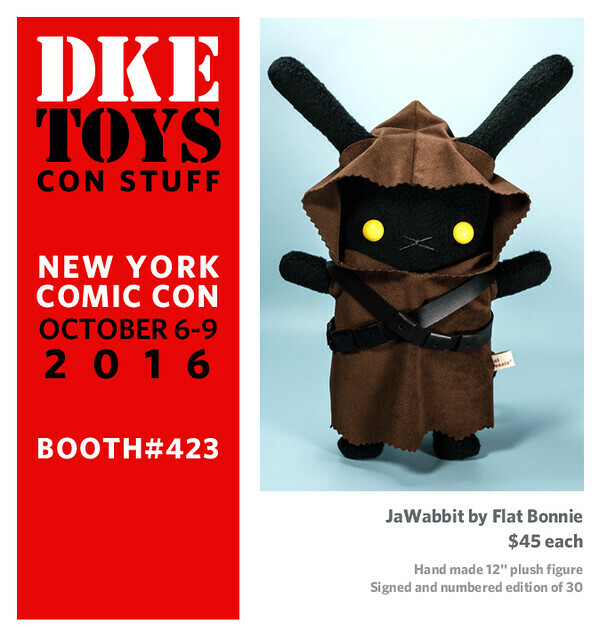 Flat Bonnie created a special version of their famous little bunny in cosplay as JaWabbit for New York Comic Con. Each handmade and hand sewn piece is made from soft fleece, vinyl pleather and safety eyes. They are 12″ tall, signed and limited to 30 pieces and retail for $45 each. 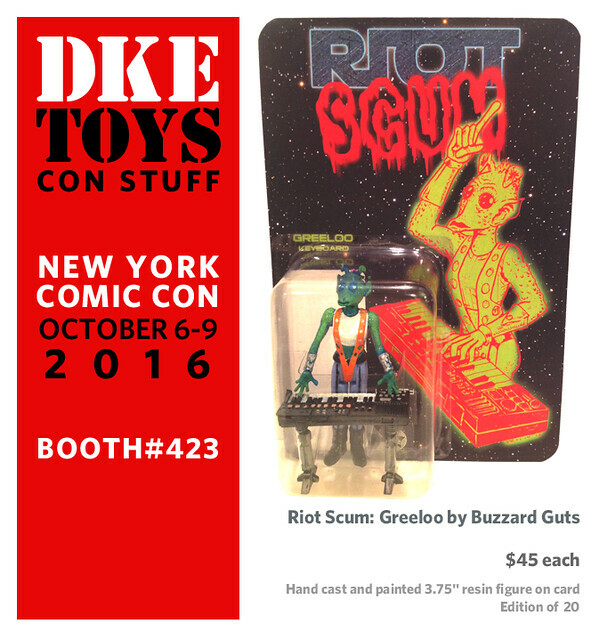 The second addition to the Riot Scum figure line from Buzzard Guts and a collaboration with Last Boss Comics’ Neil Devlin. Witty Rodian and musical virtuoso Greeloo, rocks the one liners just as hard as she rocks the keys. She joined the band shortly after a gig at the Mos Eisley cantina where they were introduced by the opening band, Chewy Lewis and the News. Hand cast and painted 3.75″ resin figure on custom card. $45 each. Edition of 20. Dain Marx is a Georgia based multimedia artist that has been making handmade resin action figures under the Buzzard Guts brand since 2014. Also, a self taught multi-instrumentalist he has played in various “rock combos” covering a variety of genres and has performed on dozens of U.S. tours and was among the company present that witnessed Hunter S. Thompson’s ashes launched from a cannon. Recently, he produced a music documentary called A Peculiar Noise about artists and musicians living in a southern college town. After a sold out SDCC edition Artbot138 is back with the second and final installment. Each hand cast and painted 3.75″ scale carded figure comes with an actual vintage 7″ record with Artbot138custom label. The “robot” has been modified to resemble a vintage UZAY figure. Edition of 40. $65 each. James Garrett (ARTBOT138) is an artist based in Dallas. During the day he designs scientific educational material. At night he uses many of the same skills on his personal projects. James paints, illustrates, sculpts (physically/virtually), and molds/casts. The work is highly influenced by sci-fi, punk, and skateboarding. In 2016, James developed a Lego version of BB-8 that is currently being reviewed for production by the Lego Group. He is currently developing an expansive original multimedia project that will roll out in 2017. Special Ed just couldn’t hold back for NYCC. Their third piece for the show is the Salacious Protester, a follow up to their hit Protest Trooper. Signed and numbered edition of 50 pieces utilizing an actual vintage Kenner Salacious Crumb figure from 1983 in each one!!! With the very low price of $30 how could they last? AH HA HA HA HA HA HA HA HA !! !